"It effectively replaces both the Ryzen 7 1700X and 1800X by delivering higher performance than the 1800X at a price cheaper than the 1700X." Didn't see its all-core turbo yet but it looks about 10% faster than 1800X at stock settings. 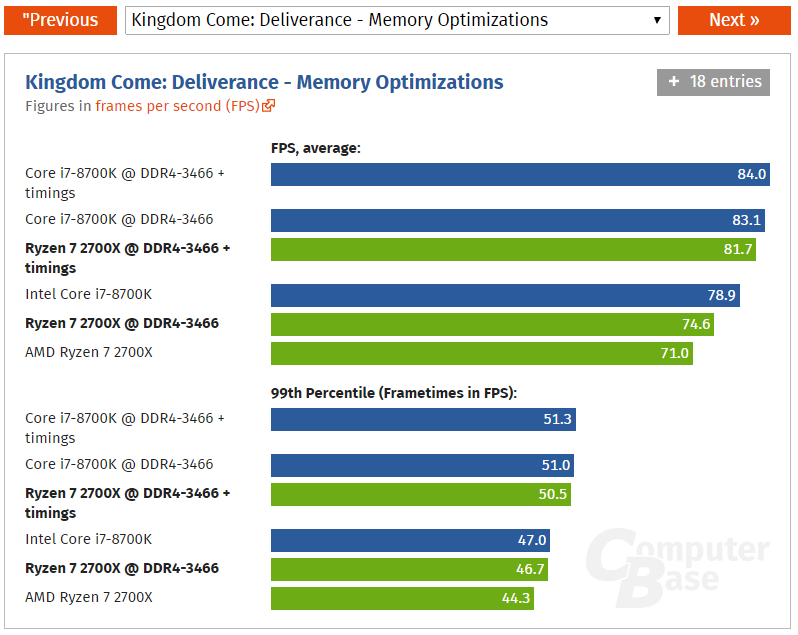 It just might be that benchmarks are showing the changes to turbo and XFR and stuff. I don't think it's a good upgrade for any Ryzen 1st gen owner(R5 1600 and up that is) unless it's absolutely necessary. I'd probably wait for 7 nm 3rd gen at this point. yeah, If you have something that works, unless it doesn't work the way you want it to, don't upgrade. For someone like me, still with an FX-8350 system that works just fine, it would be a consideration. However, with new tech coming out all this year and RAM prices still in the shitter, I'm still waiting for 2019 to upgrade. FX series are pretty ancient at this point. Eventho it has high enough clockspeeds, its IPC is way below most things. RAM price fixing is really annoying but if you want to pull the trigger on an upgrade, I'd say just go for it. It's a good time to upgrade with new gen Ryzen CPUs and new gen Nvidia cards. No clue when Nvidia is gonna launch its new cards tho. Thing with Ryzen is you can just buy it whenever these days since AMD is probably gonna be slashing prices to gain marketshare every year. You can buy a new gen Ryzen CPU for about 70% of its MSRP every year around Black Friday. It's actually nice since Intel CPUs are almost never on sale and old gens are sold at MSRP because there's no stock. Why are they testing with a 6700K instead of an 8700K? Could be. Maybe they're saving the 8700K comparison for the 2800X. But even then, it's stupid to use 2 generations old hardware for comparisons. Kinda but Kaby lake is only a minor refinement over Skylake. And seeing how Skylake and Kabe have better single core performance over coffee maybe thats why? They should of tested with kaby from IPC perspective though but would have been a really small increase. Still, Coffee Lake is the current competition, so not using it for reference is strange. As far as daily use I'd be highly suspicious of it outperforming any latest gen Intel CPU's outside of an i3, though I'm sure it is a good CPU. This is the result of an early RAM overclock with an immature BIOS, showing 3600+ frequency on RAM with tight Cas 14 timings on a R5 2600X. Shows up to 15% RAM latency reduction compared to 1st gen Ryzen with improved RAM overclock capability. 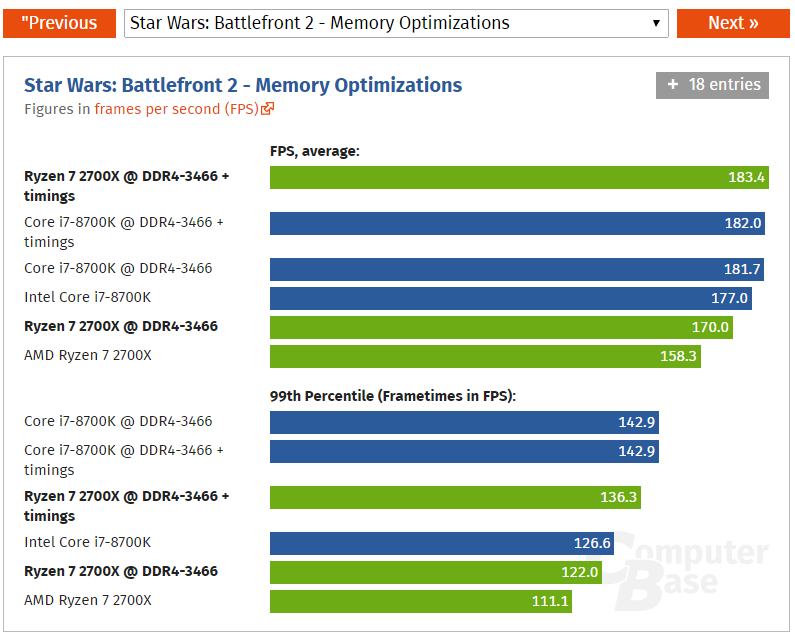 AMD seems to have taken user feedback to heart and improved upon their IMC compared to last gen Zen. Frequency improvements of the new process doesn't seem that good at this point but RAM latency reduction should impact gaming performance nicely. Intel GPU? I'm somewhere between, "you're out of your goddamn mind" and "I'll believe it when I see it". It will not be a high or mid-range performance part. The 8700K isn't even on the BF1 benchmark lol. But this looks great - means Intel needs to step up their game again. The CPU market can become exciting again! Maybe Intel will slap a competetive price on 8700K's and on the 9700K which will feature 8 cores to really get themselves back into the HEDT race. Hoping the 2800x is AMD's 12c 24t CPU and can be OC'd just as well as the 2700x. I think that will be the ultimate CPU, and it will definitely be competitively priced again Intel. If you have an AMD CPU and Intel Discreet Graphics that might be the perfect pair for Star Citizen, or any game really. I can't imagine a more perfect combo, even more than Intel CPU + Nvidia GPU. I believe it will cater to everyone, low, med and high. Your assumptions are quite... Unique. Computerbase shows 2700x edging out 8700k (both at stock freq.) here and there with a nice RAM overclock and thightened secondary timings @1080p using a 1080Ti. Ryzen+ is OK, 3rd gen should be better. If they release a 2800x, it'd be 8c/16t, best binned Ryzen+ chips pretty much. Don't expect much, maybe 4.4-4.45 1-2 core turbo at stock. Not expected until 2020. I still think it won't be a mid to high end gaming choice until many years after that, if ever.